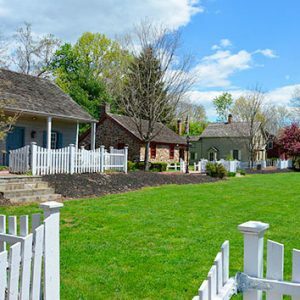 Founded by Dr. Joseph Kler in 1971, East Jersey Old Towne Village is an open-air museum located in Johnson Park in Piscataway, New Jersey. The Village is a collection of fourteen Raritan Valley area historic buildings and includes original, reconstructed, and replicated 18th and 19th century vernacular architecture typical of farm and merchant communities of Central Jersey. It is home to a permanent exhibition about Raritan Landing, an 18th-century inland port once located just downstream on the river. The Village offers awarding winning exhibits and programs, and is a gateway site for the Crossroads of the American Revolution, a National Heritage Area, highlighting the important history of the Raritan River Valley. Explore the restored buildings attributed to the early settlers and archaeological discoveries at the long vanished colonial river port community of Raritan Landing. Historical interpreters bring the Village to life through historic trades and artisans – masters, journeymen, apprentices and interpreters use tools and techniques of the 18th century. View the Raritan Landing collection, along with many artifacts, including furniture, household objects, tools and antique agricultural equipment.